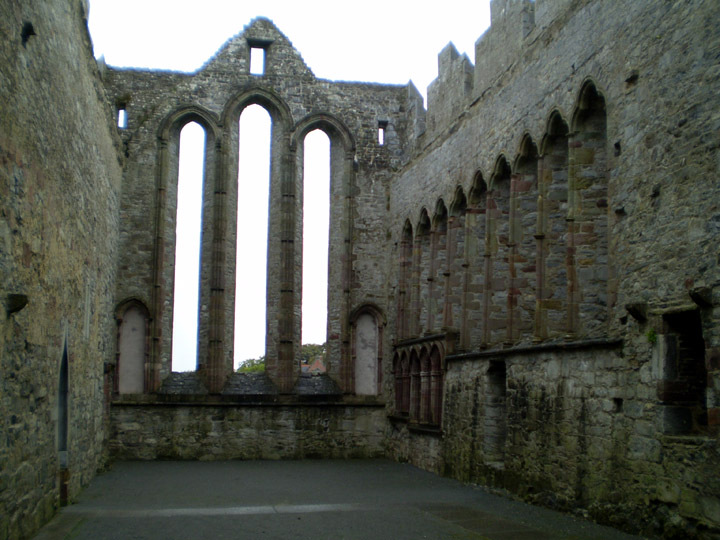 Just North of the Dingle Peninsula and the city of Tralee is Ardfert Cathedral. 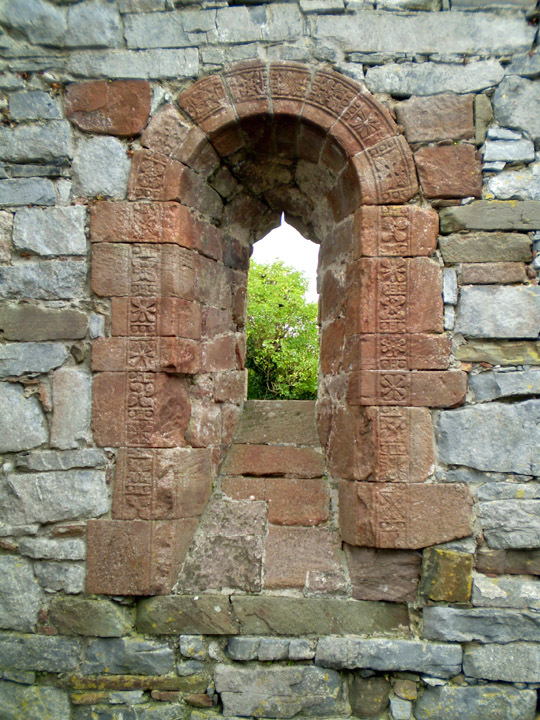 Constructed in the 11-12th century, this site is associated with Ireland’s other great Saint, Brendan the Navigator. 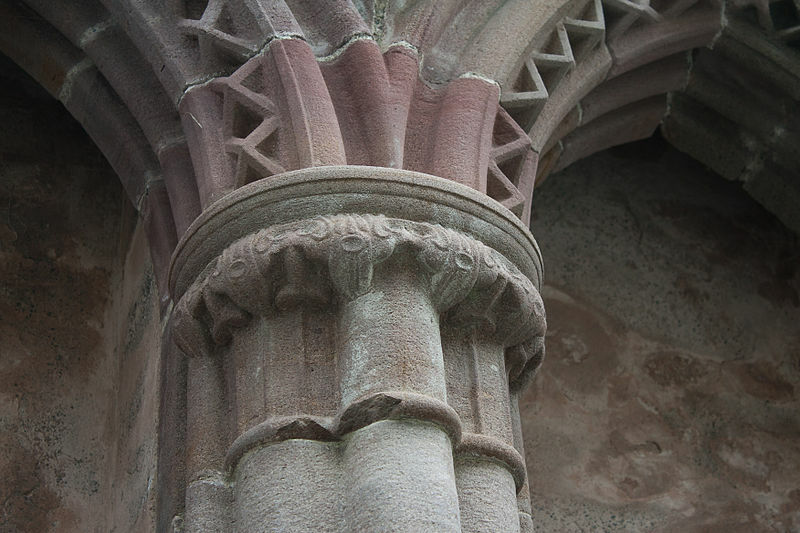 The otherwise large and austere Cathedral is decorated with some delicate Romanesque designs along the doorways, windows and choir column capitals. You can see how building practices improved as the left wall from the 11th century was completed without windows whereas the right wall contains nine tall lancet windows. Crenelation, the squared edge wall topper we often associate with castles, was added along the roof line in the 15th century to form a battlement. Facing the altar in the nave of the Ardfert Cathedral. Note that the 11th century wall on the left does not have windows. 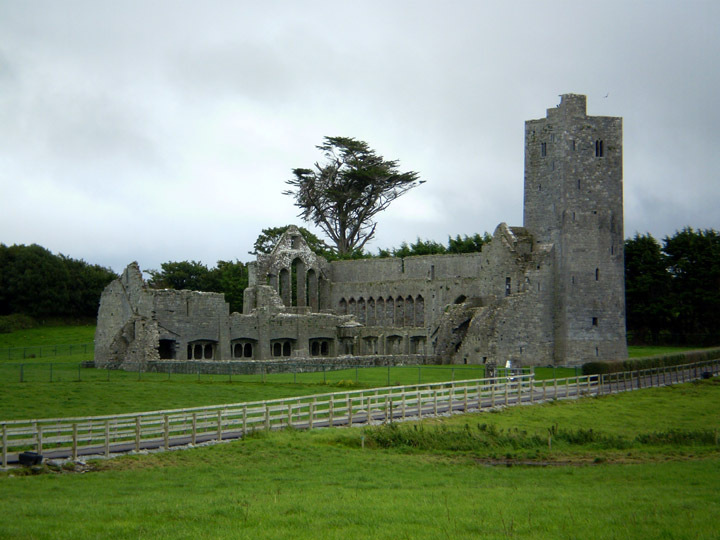 Maybe half a mile away from Ardfert Cathedral is the 13th century Ardfert Franciscan friary situated in the middle of a green pasture. From afar it looked very much like a Romantic Victorian painting and one poem away from going sepia toned. I’m not exactly sure if one is allowed to climb through the ruin but we did, even though it meant passing through a few cattle gates. 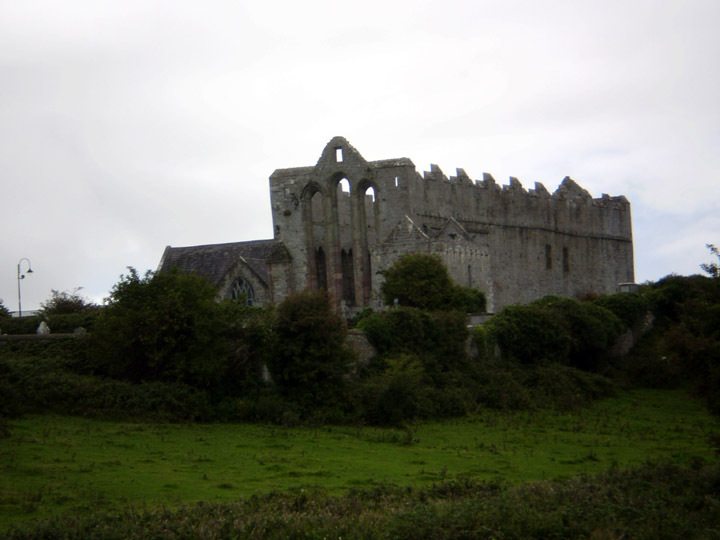 Ardfert Abbey sits just behind the Cathedral in the middle of a literal cow field. 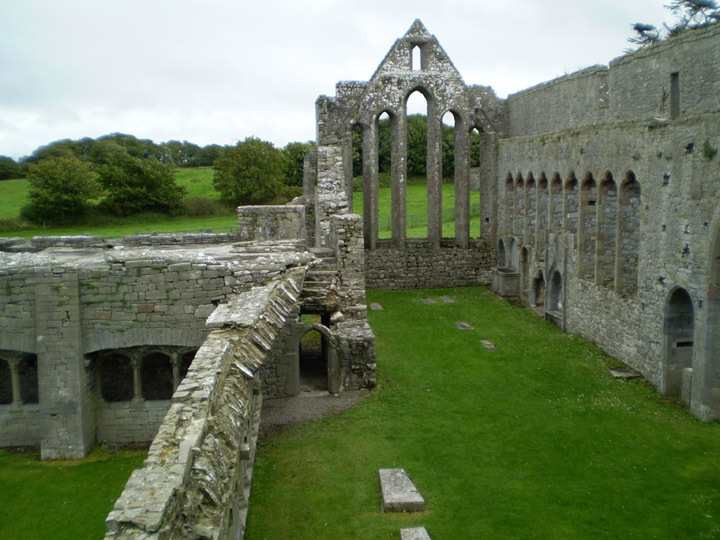 Lacking any modern reconstruction, the Abbey is still surprising well-preserved. One wall of the 13th century Romanesque church is intact with its two registers of solid arches. Of the 15th century cloister, one wall of the square complex remains, complete with its side rooms and arcaded walkway. 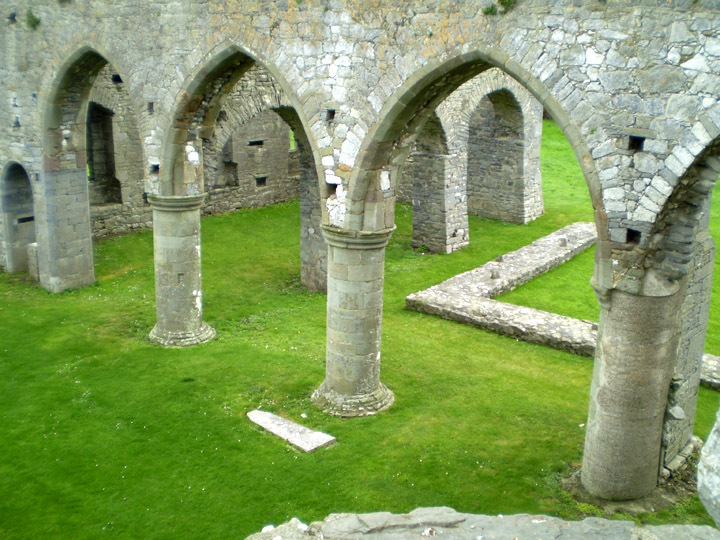 Arches along the Nave of the Ardfert Abbey chapel. Before setting out that morning to Ardfert, we bought some smoked salmon, cheese and bread from the farmer’s market in Dingle. Taking our incredibly fresh and delicious snacks, we climbed a small staircase to the second floor of the Cloister. We picnicked with a fantastic birds-eye view of the Abbey chapel and Cathedral. In the couple hours we spent at the Abbey, not a single person (or cow) came by. We even got a break in the clouds for a little blue sky! I think the former friars would be happy with the peace and quiet their home now enjoys. Climbing another staircase near the entrance of the chapel, you can see the second floor of the cloister (left) where we ate lunch. Super account and pictures. I’ve never been here. Will make a special note to visit now, the next time I’m down that part of the country. Great post, thank you. -A.